I recently bought an inexpensive spin bike off of Amazon. It has good customer ratings and comes out of the box with all of the features you could want from a spin bike that costs less than $300. I really like it A LOT! The bike retails on Amazon for $259 but I was able to get an Amazon Warehouse Deal and only paid $220 so it was an extra good bargain! 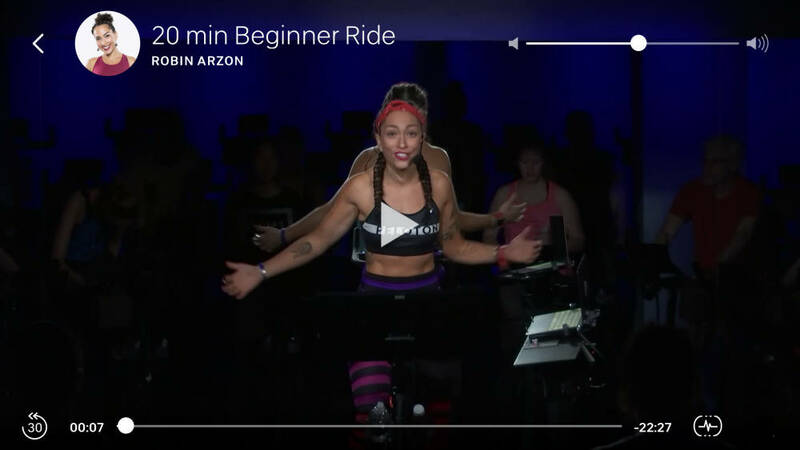 When the bike came I downloaded the free trial of the Peloton app because their video classes are really well shot and the instructors are total pros. But everyone in the videos are using awesome Peloton bikes that come with cadence and speed readers. The instructors often shout to go at a certain cadence or speed and I had no idea what my stats were since my inexpensive bike doesn’t come with sensors. … And as a runner addicted to her Garmin Forerunner for stats I really wanted to know what my numbers were! I started looking online to see if I could find a way to upgrade my new spin bike. Buying a Peloton would be cool but they’re like $2,000 and that’s a lot of money to spend on a bike when I am not super passionate about spinning/biking. 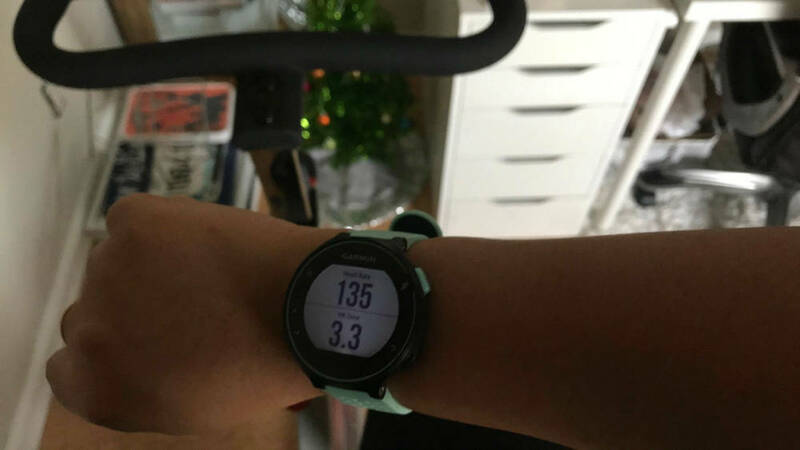 I found this article from a dude who had bought a similar spin bike to mine and with a few inexpensive modifications he was able to upgrade it into a DIY Peloton. He recommends buying this bluetooth cadence sensor but I decided to buy the package that includes both the cadence and speed sensor. They’re just two little sensors you stick on to your bike pedal and flywheel that give you feedback as you spin. I also bought an iPhone bike mount so I can view the data and the Peloton videos while I’m riding via my phone. He bought an iPad mount but I don’t have an iPad and don’t want to buy one just for the bike so I’m just going to use my iPhone 7Plus for now. Of course I’ll be able to track my heart rate using my Garmin Forerunner 235 so there was no need for me to buy a heart rate sensor. If you don’t have a heart rate monitor you can buy one on Amazon inexpensively. From what I’ve read you can connect the Wahoo app to Strava which also integrates with Garmin so you can pull all of your data together for each ride in one record inside Strava. For about $85 I was able to upgrade my $220 spin bike into a DIY Peloton. It’s not exactly the same but it gets the job done for a fraction of the price! I mean it doesn’t allow me to connect with other classmates or anything but as a fairly non-social person that doesn’t bother me (and isn’t worth another $1500+ for me). Maybe someday I’ll buy a Peloton, there is no doubt they are awesome bikes, but I am happy with what I have for now! The only other thing I might add is a water bottle holder :). As soon as all the additions come I’ll post an updated pic! Any questions about upgrading just drop me a comment below! Wow that’s cool! My brother has a really good bike that he hooks up to a program and he can ride in his basement with others. It’s not a spin bike but I guess you call it a trainer? He is really seriously into tris and half ironmans so he uses his a lot. Yeah that totally makes sense that your bro invested in an awesome high tech trainer! He is such an amazing cyclist. I am but a mere dabbler :). Awesome!! I think it will be fabulous cross training 🙂 I may need one! I have never heard of smashrun, I just google’d it! Thanks!! I’ve been mulling over getting this bike for the exact same thing. I read this article http://www.mypursestrings.com/peloton-app/ and that sparked my interest about the diy process. The real bike looks cool at the Peloton store but can’t justify the price and monthly cost for it. I hadn’t thought about using my watch as the HR monitor. Exactly, I totally couldn’t justify the price, but I love the app. The instructor called Robin Arzon is my FAVORITE she is so awesome! Thanks for sharing that link, that’s helpful to know what setting the wheel needs to be at for the speed clip to work. That would have probably taken me way too long to figure out on my own haha! Interesting! I have a friend that does the Peloton classes because it always shows up in his Strava activities. (and I always think he actually took the picture of the person leading the class. haha!) I’m seriously thinking one of these bikes might be a Christmas present for Alan and I. Are there any things about the bike you wish it had beyond these things you’ve DIY’d? Is the bike solid? Easily adjustable to a different person’s height (for sharing it)? I don’t take spin classes so I don’t really know what to look for – but I’m not really interested in using my new bike on the bike trainer that we have. It’s too nice for that! Hey Lisa! I really like this bike a lot. It is solid and 100% adjustable for different heights. I’m 5’5″ and Adam is 6’4″ and it works for both of us. It’s slightly less comfortable for him; I did read that it works best for people up to 6′ but that being said it does work for him for the purposes he uses it (warming up). The only caveat is that I think it’s only good for up to 230lbs or maybe 240lbs. Because Adam is 6’4″ and 220-ish it probably isn’t stable enough for him to ride in the standing position unless the resistance is pumped up super high. He probably also wouldn’t use it very aggressively (high speed). I’ll have him give it a try and see how it feels and let you know though! I know Megan said Paul rides a similar spin bike. I wanted to buy the one they have but it was sold out at the time I was shopping. You might want to look into that one too to see if it might be more stable for Alan if you think he’ll use it a lot or will want to ride hard on it. I’ll ask adam to put the bike through it’s paces tonight and let you know what he thinks. So far he’s just done easy rides.